Valve boss Gabe Newell has insisted that gaming piracy can be easily dealt with by offering people a decent service that they cannot get illegally. Newell – using Russia as an example – told Geek Wire that when people are offered a good service for a decent price then piracy becomes less of an issue. "One thing that we have learned is that piracy is not a pricing issue. It's a service issue," he said. "The easiest way to stop piracy is not by putting antipiracy technology to work. It's by giving those people a service that's better than what they're receiving from the pirates." "You say, 'Oh, we're going to enter Russia', people say, 'You're doomed, they'll pirate everything in Russia'. Russia now outside of Germany is our largest continental European market. "The people who are telling you that Russians pirate everything are the people who wait six months to localise their product into Russia. ... So that, as far as we're concerned, is asked and answered. "It doesn't take much in terms of providing a better service to make pirates a non-issue." 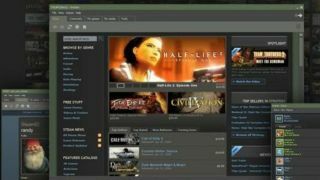 Considering Valve is the company behind the now mighty Steam service this is certainly an opinion worth listening to; although the likes of Microsoft and Sony might not be quite in agreement.